Sea-Tek Power – Delivers propulsion systems and waterjet based on well-known brands. Sea-Tek Service – Perform service and maintenance to work boats. Sea-Tek Supply – Import and distribution of maritime high quality products. 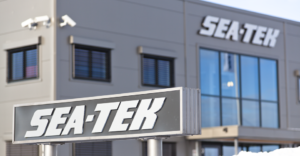 Sea-Tek going through providing high-quality products, flexibility and good reputation give the customer a carefree life. In order to ensure that we live up to our responsibilities and expectations we have formulated a common value base and a set of ethical guidelines. Sea- Tek’s goal is to provide high quality services and products that meet our customers’ requirements, expectations and needs. Our services must also meet the requirements set by the authorities and the company itself. Sea-Tek AS will deliver agreed product and service at the right time and price. We have established and documented a quality management system that is certified according to the NS-EN ISO 9001: 2015 standard. The quality system is part of our overall management system and will ensure compliance with the company’s internal procedures, as well as customer requirements and expectations.